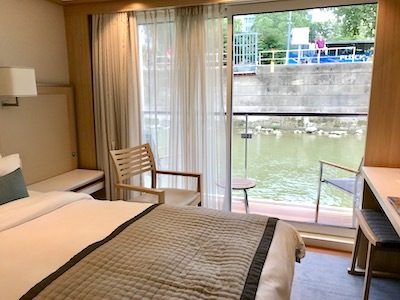 ABOARD THE VIKING VILHJALM — Overnight flights leave most travelers tired and groggy, a feeling I experienced upon arrival in Budapest. Clearing customs quickly, my travel partner and I met the Viking Cruise representatives at the baggage claim exit. They escorted us to a bus that delivered the group directly to the Viking Viljhalm docked on the Danube River. 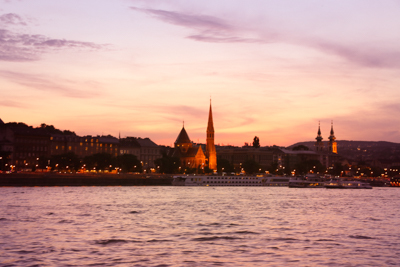 The mighty waterway, famous for the Straus Waltz, splits the enchanting capital of Hungary with Buda on one bank and Pest on the opposite side. A warm welcoming surprise awaited – – a stateroom ready for check-in before noon. How nice to freshen up after an overnight flight before enjoying a casual buffet lunch on the al fresco-dining terrace. Chef’s variety of fresh, light items and more substantial choices made a colorful display. The meal satisfied but the relief of settling in topped all. We retired for a brief nap, slipping into soft white linens and a slew of pillows. The Viljhalm’s 205-square-foot Veranda Stateroom made for a bright, sleek and clean refuge. Oak veneer surrounds, a large mirror and 40-inch flat screen TV dominate the far wall. One counter section fashioned into a vanity area offered a stool, while the opposite end houses a mini-refrigerator. Another chair sits beside the double bed. The best part of the room may be the double floor to ceiling sliding glass doors that open onto a private patio – – a window on the Danube’s world. A relaxing a cup of coffee or glass of wine makes watching the river meander by delightful. The well-planned design even includes a small coffee table. A full-length mirror adorns the cabin door. The bathroom, small as expected, proved quite workable. A shelf below the sink can store e toiletries and two cups were attached to the wall. The shower pressure proved excellent. Not only can you control the room temperature; how about heating the bathroom floor! Time to unpack. Each of us filled a set of three deep drawers and divided the closet space, finding the room more than ample. Stashing suitcases under the bed offered one of the great conveniences of cruising. The Viljhalm docks at the ultimate riverside landing on the Danube River, the first boat directly below the iconic Chain Bridge. 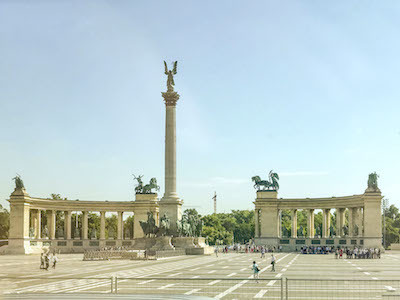 The awe-inspiring Buda hillside commands attention, not just beautiful, but witness to more than a thousand years of history on the very spot. Castle Hill, Fisherman’s Bastion and the Gothic church spires that soar above are a constant lure. Viking offered a 45-60 minute walking tour, but we couldn’t wait to get reacquainted with the city. We took a serendipitous stroll to nowhere in particular. Little shops,chockablock with souvenirs, street side cafes, and appealing Art Nouveau buildings dotted the streets. The hint of spicy aromas filled the air, as did the melodic sounds of a busker playing the violin. We wandered into St. Stephen’s Basilica, with its wealth of Baroque design. The massive domed building looks older, both inside and out, than its 1905 construction would suggest. We returned to the boat for a welcome party, champagne toast and information session. Joe, the Cruise Director, reviewed the schedule for the following day and answered all questions. A relaxing dinner in the main restaurant followed featuring, of course, the national dish of Hungry, Goulash, and options that included ahi tuna. Staples like ribeye steak, chicken, and burgers are always available. The food preparation and presentation rank on par with high-end restaurant fare. No, not Michelin star pizazz, but cooked by a serious, competent and attentive chef. Forgoing after dinner coffee, we headed to the top deck for the gorgeous sunset – – a stunning backdrop to the sights on the hills of Buda. Soon, dancing lights waltzed over the Danube, beckoning all to the Sun Deck. The Viking Viljham offers million-dollar views – – nearby landlubbers gathered on the Chain Bridge to share them. By bridge or boat, the illuminated splendor of the Buda hillside is unforgettable. There is little to argue with those who call the panoramic scene the most splendid in the world. A long trip behind, a head full of the day’s delightful visions, we slipped into bed anticipating the adventure ahead.